Opening this Friday, March 20 in NYC is Can't Stand Losing You: Surviving The Police. 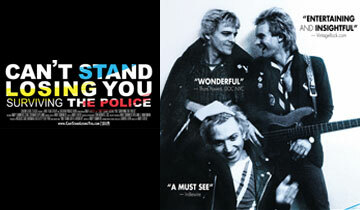 Based on the acclaimed memoir 'One Train Later' by rock guitarist Andy Summers, the film follows Summers' journey from his early days in the psychedelic ‘60s music scene, when he played with The Animals, to chance encounters with drummer Stewart Copeland and bassist Sting, which led to the formation of The Police. During the band’s phenomenal rise and its dissolution at the height of their popularity in the mid-80s, Summers captured history with his candid photographs. Utilizing rare archival footage and insights from the guitarist’s side of the stage, Can't Stand Losing You: Surviving the Police brings together past and present as the band members reunite, more than two decades later, for a global reunion tour in 2007. Directed and edited by Andy Grieve with concert footage directed by Lauren Lazin. *Q&As following Fri. (3/20) show with Andy Summers and Sat. (3/21) with director Andy Grieve.